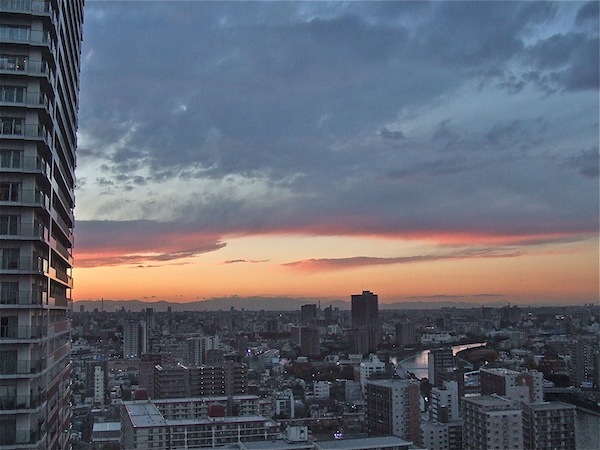 Though we miss living in Tokyo, especially shitamachi, we don’t really miss the highrise kodan where we spent eleven years. Until the earthquake our main complaint was the mostly insular nature of highrise life, the feeling that it was always difficult to get in and out, but during those weeks after the temblor it became a nerve-wracking experience, even as we became convinced that the structure was safe. We wrote a number of posts here about that experience and even one related column for the Japan Times (though it seems to have been taken off the JT site). For a while the media and the market seemed to concur with us that highrises may not be a wise option for a city that could be hit with its own big earthquake at any time, but eventually fears subsided and highrise condos started selling again; quite well, in fact, so we assumed our fears were just our own and didn’t extend to the general population. Even Tsutomu Yamashita, a housing journalist who is unusually frank about these sorts of matters, has come around and said that investing in a highrise Tokyo condo is a good idea since they’ve become even safer since the quake. A recent article in Aera, however, has confirmed our initial sentiments. Opening with a frightening “what-if” scenario describing a 7.3 magnitude quake happening under the capital, the feature makes the case that even though these highrises will not collapse, life will essentially be impossible in them indefinitely. The most immediate concern, and the one that made the biggest impression on us in the aftermath of the 311 quake, whose epicenter was hundreds of kilometers away, was the loss of elevators, which shut down automatically when a building shakes. According to law, they can only be turned on by a certified technician, which means even when the shaking stops residents will have to wait for that technician to show up, and he may be inspecting other highrises. This problem multiplies with the intensity of the jolt. And if the quake is strong enough to knock out electricity, then the elevator problem is exacerbated. Under such circumstances, the residents on higher floors become like “people stranded on the top of a mountain in bad weather.” The idea of walking down and then up emergency stairways to run errands or whatever is just impractical, and virtually impossible for the elderly, the handicapped, and pregnant women. Most highrises have emergency generators, but these are for contingencies and thus only have enough power for maybe two hours. So if the elevators are out due to loss of power, that means the stairways are also dark. And even if the building structure is sound, some elements, such as doorframes, could be compromised, making it difficult to get out of an apartment. All highrises have emrgency ladders connecting verandas for use during fires, but it will be very difficult to use them to get all the way to the ground. The Tokyo metropolitan government has said that in the event of a major quake their estimate is that it will take at least a week to recover electrical power. Also, highrise residents will likely be lower down on the list of people receiving attention during rescue operations because of the difficulty for crews to access higher floors. Emergency services will first attend to victims they can reach more easily. One of the reasons people believe that Japanese highrises are so safe in a major earthquake is because very few have actually gone through one. It wasn’t until the late 1970s that residential apartment buildings of more than ten stories were built in Tokyo and other major cities, and according to Prof. Koichi Nakagawa of Osaka City Univ. experts can only guess what will happen to them if a major quake occurs in their vicinity. There are three general types of quake-proofing construction: taishin, meaning the structure itself absorbs the energy; menshin, meaning the structure has shock absorbers in the foundation; and seishin, meaning the actual building material absorbs the energy. These technologies are designed to prevent the structure from collapsing and, especially for menshin and seishin, to minimize swaying on the upper floors, but there are two types of vibrations caused by earthquakes, long cycle (choshuki) and short cycle (tanshuki). Tanshuki vibrations are more readily felt and tend to last only about 20 seconds. This sort of vibration characterized the Great Hanshin Earthquake of 1995, which caused a great deal of damage close to the ground. Choshuki vibrations are less noticeable physically but since they last longer they cause more damage on the upper levels of highrises, which sway much more. During the 311 quake, the top floors of the Sakashima government building in Osaka, which is 52 stories high and located 500 kilometers from the quake’s epicenter, swayed up to 2.7 meters in either direction. Ceiling panels fell to the floor and more than 360 points of damage were recorded. Moveover, any major quake will inevitably be followed by aftershocks, which could do more damage to individual units. This was our main anxiety after the 311 quake. Every day there were aftershocks, some strong enough to knock out the elevators again and generally just working on our nerves. Even if there is no damage to your own condo unit, highrise living becomes much more difficult in the aftermath of a disaster. If there is no electricity there is no water pressure, meaning no drinking water or flush toilet usage. Rooftop water tanks might be damaged as well as exterior pipes. One highrise in Sendai had problems with leaky pipes, and raw sewage from the upper floors flooded units on the lower floors. Residents will have to keep their personal waste in buckets on the balcony because there will be nowhere to dump it. But another consideration that the article brought up, and one that we became acutely aware of the very day of the 311 quake, is that highrise residents “are usually the kind of people who don’t have relationships with their neighbors.” Communication and cooperation are essential in a disaster, and there was virtually none in the building we lived in. It seems to be why people move into highrises–to be left alone. This is exactly what happened after Hurricane Sandy hit downtown Manhattan. There were several high-rise apartments without electricity and running water for weeks. People had to climb up and down as much as 20-something floors to get to work, to bring water up for drinking, cooking, bathing, and flushing the toilet. As I mentioned this lasted for weeks. If you’re young and fit, it’s just a major hassle, but there were also elderly residents who were literally stuck in their apartments, living on canned food. Emergency services were so overwhelmed that calling 911 to get them out or bring food was not working. They had to rely on the kindness of neighbors and strangers. I heard these stories from friends and friends of family who were stuck in their high-rise apartments after the storm. The elevators in my 40-story hi-rise in Tokyo were out until the evening of 3/11, and then only one of three elevators worked for several days. Technicians needed to check the machinery and restore service were spread thin and had to prioritize. I had purchased on the 9th floor because prices were much higher from the 10th floor up, but it turned out after 3/11 that a lower floor was more desirable. I was able to use the stairways a couple times a day without too much difficulty. Tokyo is mostly safe from Choshuki – this is due to the depth the bedrock extends. The wave rebounding in this depth does not match the resonance frequencies of large slender objects. The long ‘surface wave’ form of energy travels distances efficiently so thats why it can be felt a long distance away, however it is more likely to damage something more cube like in nature (eg oil tank in refinery) in areas of certain bedrock charactersistics. This is all well known in civil engineering – however if you doubt this please check archives of english version of nikkei paper english weekly edition they had a lengthy article nearly 2 years ago. Japanese engineering is high quality and you should be more trusting, these designs have been tested using complex pc programmes as well as small models etc. personally i would be more worried about soil liquidification causing buildings to tip or fire damage from the body waves. Swaying of buildings is not uncommon (actually it is constant – always swaying any time of day) buildings are designed to do this. It will be a buildings that doesnt sway that falls down. Next time you are in a plane watch the flexure of the wing tip at take off and imagine multiplying that flexure to the scale of a large building – basically the same principal in both situations. My personal analysis is that Tokyo is very safe to be in the event of a large earthquake – as long as you dont live in one of the old wooden housing groups/blocks which are a fire trap and you have some simple supplies for a week or two. Personally i like high rise as it reduces peoples footprint on the earth…. Also did you know there is a small smiley face at the bottom of the page?! We shall see about that in due course…like we saw how very safe the tsunami proof walls were. Nature has a tendency to make a mockery of man’s best intentions. So take care! And don’t believe the salesmen or the pc simulations.